Outside of a couple of Samsung and Blackberry handsets there aren’t many options for near field communication for the common consumer. Moneto wants to change that. Moneto launched in January and interest has been high so far, though sale numbers weren’t available, says Amitaabh Malhotra, COO at DeviceFidelity. The company is planning to target the 18- to 34-year-old demographic with a marketing push in the second half of 2012. A partnership between Device Fidelity and SpringCard, the new company aims to bring NFC to any Android or iPhone using a prepaid MasterCard account. iPhone users can purchase a protective case that includes a microSD card that costs $79.95 while Android users get a microSD along with a sticker that amplifies the NFC signal for $29.95. The account comes preloaded with $10. Moneto can be used to make mobile NFC-based payments at any merchant location accepting contactless MasterCard PayPass transactions. Additionally, the accompanying traditional plastic card can be used for magnetic stripe-based transactions at any location that accepts MasterCard. I tested the solution with my iPhone 4. The package included a traditional prepaid MasterCard, a plain white card that contains the microSD, the iPhone case and a USB cord. There were also instructions and terms of service for the account. To begin, I pulled the protective case into two pieces, popped the microSD card into the spring-loaded slot in the back of the handset case and snapped it together around the iPhone. The case connects using the 30-pin iPhone connector replacing it with a mini USB port. The supplied cord enables syncing and charging using the USB port since the 30-pin connector is no longer available. At the iTunes App Store I downloaded the 3.6 MB Moneto app, synced the device and completed the registration process entering name, address and Social Security number. This process was easy enough but I would have preferred to do it on a computer with a regular keyboard. I selected a PIN for that app and was ready for mobile payments. The available balance appears at the top right of the screen along with a big blue pay button and other app options, including history of transactions, locations where the app can be used, account info, reload options, transfer and rewards. Transfer and reward options are not yet available. In the coming months, however, users will be able to transfer money to other Moneto users and participate in a rewards program, says Malhotra. 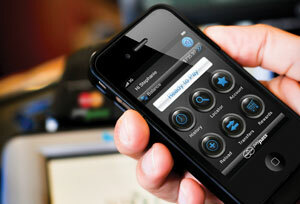 Adding funds to the account may seem cumbersome to some users. Options include direct deposit from payroll, ACH transfer from an online bank account, MoneyPak Green Dot, MoneyGram or PayPal. Malhotra says they are looking to expand these options further in the future. Since I already have a PayPal account, I choose that option. Because I didn’t have a bank account linked to PayPal, I had to do that through my online banking site. At that point I was able to transfer funds from my banking site to Paypal and then finally to the Moneto account. The major drawback is the one to four days it takes for the new funds to show up in my Moneto account. For me, the real drawback is the $4.95 monthly fee. I’m not accustomed to paying for banking service–I don’t even have a card with an annual fee–so paying a monthly fee for the privilege of using my phone to pay at a handful of merchants is a bit of showstopper for me. Malhotra says that once the rewards program is up and running, users will see that $4.95 returned to them in various rewards every month. Also, because the MasterCard prepaid card can be used to make purchases anywhere and to get cash at ATMs, the account has functionality beyond the contactless-accepting merchants. For now I don’t see the value. Within two miles of my residence the app lists eight places that would accept the payment technology, three of which are CVS Drug stores. I would like to keep using it but the $4.95 fee is too much for the limited use. Couple that with the $79.95 price tag to purchase the case, and I am skeptical that many people will be willing to spend that kind of money to make purchases with their phone. Once Moneto rolls out the rewards program there may be a benefit but until I see that it’s difficult to say. As for the hardware and app, however, they seem to work well. It took me a few seconds to find the sweet spot for the signal on some contactless readers. At first I found myself fumbling a little bit at the point of sale but the usability improved as I became familiar with the process. And to my surprise, the iPhone case itself is very nice. It adds a little length and bulk to the handset but nothing that’s too noticeable. For those who use their iPhone on a dock frequently, they may be frustrated because the 30-pin connector is blocked and you have to remove the bottom half of the case to plug into a dock. Future enhancements might make the $4.95 worthwhile. Besides adding the rewards program to Moneto, the company also envisions a future where other apps could be added to the microSD card, for example, a local transit application or physical access credentials. 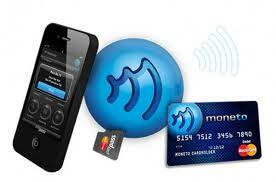 Overall, if you want NFC for your iPhone and are willing to deal with the $4.95 monthly fee, Moneto is a good option. For me, when my bank offers an option I’ll be jumping on that as long as associated fees aren’t there.